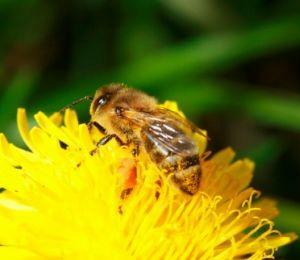 Are you seeking treatment for a bee sting? There is plenty of joy to be found while exploring the great outdoors. Often, it's not until we've experienced the painful sting of a bee that we're reminded we share the outside world with hundreds of different species of insects, bugs, reptiles and animals that can and will harm us if they feel their territory is threatened. A bee sting, although often harmless, is a wake up call that careful precautions should be made to avoid such common nuisances in the future. Remove stinger: First, you'll need to remove any remaining stinger from the outer surface of the skin. If needed, use tweezers to clamp the stinger and pull it out. Cleanse: After the stinger is removed, cleanse the bite thoroughly with warm soapy water and pat dry. Ice: Applying ice immediately to the wound will help reduce the swelling and inflammation of the sting. Apply ice in intervals of 15-20 minutes as often as needed. Apply antibiotic ointment: Follow icing with a triple antibiotic ointment such as Neosporin to reduce the risk of infection. Apply itch relief: Applying a topical itch relieving ointment such as Caladryl will help the external symptoms of itching. Allergy medication: Allergy medication such as Benadryl should be administered as directed to reduce the allergic reaction symptoms of the bite. After administering allergy medicine, avoid driving or operating heavy machinery. Pain relief: Because the body has swelled at the wound site to push out the venom, you may experience pain associated with the swelling pushing directly on your nerve endings. Pain relievers such as Tylenol may be administered as directed to help manage pain and discomfort. For those seeking natural treatments for bee stings, the following remedies have proven effective. As with all of the above conventional treatments, you'll need to remove the stinger, cleanse the skin and apply ice prior to treating the bite with these natural remedies. Baking soda and vinegar: Mix equal parts baking soda and vinegar and apply directly on the wound. Aloe Vera gel: Apply aloe vera gel liberally to the site as needed. Plantain: Plantain (a common weed) can be minced and mixed with warm water and applied directly on the stung skin. Fortunately, the side effects of bee stings aren't lingering. Most people find relief from the pain and swelling within hours of the bite. Managing pain and itching is the most important aspect of recovering quickly from the bite. If pain worsens or additional symptoms occur, seek medical attention. In cases where people experience a systemic allergic reaction affecting the entire body, medical attention should be sought as soon as possible.